As the days get cooler, I look to comfort foods like baked potatoes. Sweet potatoes are one of my favorite way to change it up a bit. For a meal or game day snack, there is nothing more satisfying than Roasted Sweet Potato Wedges. With a crisp, browned crust over a creamy, smooth center these wedges have a spicy outside, tamed with a yogurt sauce. Soft on the inside with a crust of caramelized juices makes these wedges a versatile dish. They will compliment a spicy entree or stand alone as an appetizer with the sauce served as a dip. Preheat oven to 425˚ degrees. Wash and cut each potato in half lengthwise. With the skin on, cut each half into four long spears. Cover a large baking pan with parchment paper or foil. Brush potato spears with olive oil then place wedges, skin-side down, in a single layer on the prepared baking sheet. Combine chile powder, cumin, salt, paprika and pepper in a small bowl. Sprinkle the cut surfaces of the sweet potatoes with the seasoning mix. Roast the sweet potatoes for 25 minutes or until wedges are browned and beginning to carmalize. Make the sauce by stirring together the yogurt, lime juice, lime zest and honey. 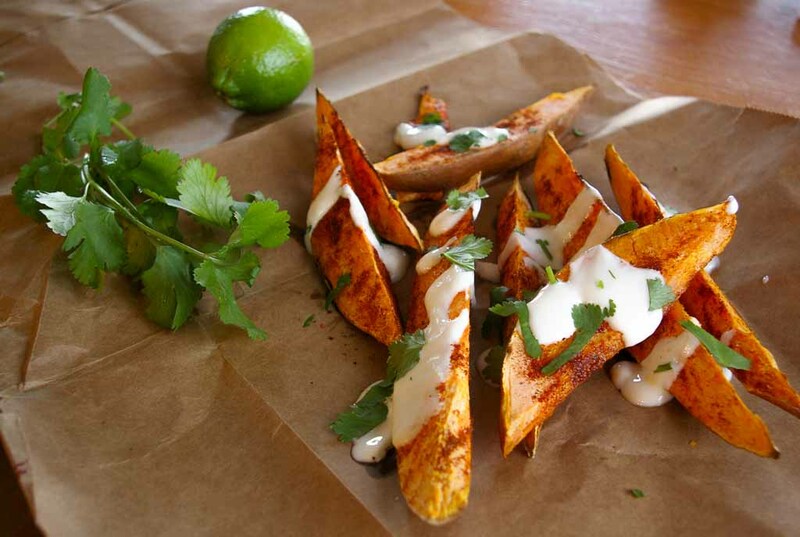 Serve the Roasted Sweet Potato Wedges on a platter, drizzled with Lime Yogurt Sauce and garnished with fresh cilantro. Covering your pan with parchment or foil is an important step for easy clean up. The juices from the sweet potatoes can make a caramelized mess on your pan.